The third installment of Gigantour, the acclaimed traveling heavy music festival launched in 2005 by Dave Mustaine, kicked off on April 12 in Denver, CO, with headliner Megadeth, Scandinavian death metal band In Flames, Finland’s Children of Bodom, Arizona’s modern extreme Job for a Cowboy and Oakland, CA, heavy power trio High on Fire. The 29-date trek has been crisscrossing North America, including a stop in Milwaukee at the Rave on May 7, before finally wrapping up on May 22 in Phoenix, AZ. For Dave Mustaine, offering a strong connection between fans and musicians is his impetus for the tour. 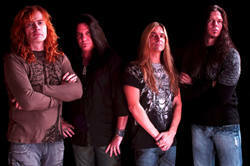 Mustaine spoke to MAX INK about the trek and band. Maximum Ink: This current trek is the third installment of Gigantour, are you happy with how it has been accepted by everybody and by how it continues to grow each time? Dave Mustaine: Yeah, it is definitely rewarding in the way that it is all going on right now; and obviously there are things we’d like to fix to make this even better but it is just one of those things that will happen in time. MI: Are there criteria you use when it comes to picking the acts that play as part of the Gigantour lineup? DM: Well, obviously, we like them to have a new record out to support which all makes things a little easier. And that gives them a little more peaked interest from the audience. And I make sure that they’re a band that is predominantly focusing on guitars. There are a lot of bands out there right now that don’t have a lot of great guitar players, and to me, they’re not even worth contemplating. MI: There are so many music festivals these days, is it hard to keep Gigantour on track? DM: It is one thing to have a festival that has constantly changing its lineups because you can always replace that by getting new talent. And to go into different territories, you need to have a really good understanding of the market place. You have to understand the people. A lot of promoters don’t want us going into their territories and bringing our festival, as to them, it is taking away their business. In Milwaukee, they’ve got their metal fest and so they’ve already got their own indigenous metal festival and so for us to go there and tell them that we’re going to bring our own metal fest, and especially that it’s not based around a celebrity like say Ozzy or something, is challenging. Let me make it clear though that Gigantour is not the Dave fest. It is a festival built around the guitar. MI: When it comes to your new Megadeth guitarist Chris Broderick, how is he settling into the band? DM: He is great and is a wonderful person and an amazing player. I think this is the best lineup yet of Megadeth and he’s one guitar player I’m enjoying playing with. MI: Over the years the media has painted you an angry young man does it bother you still? DM: I don’t care anymore about that as it is a no-win situation. There came a point in my life where journalists I realized are not assholes because they have to review your music. Some of them are assholes because they’re just assholes but some of them are great people that don’t necessarily like my music. I have some friends that are journalists and that don’t necessarily like my music and I’m okay with that. But if I was hung up on having friends that liked my music, then I would not be a good friend would I? And a good friend is someone who can say, ‘Hey Dave, I don’t like your music but I like you.’ Now that is a good friend. MI: I read an interview where you stated that your most recent Megadeth album, United Abominations made you feel good about playing thrash metal again? DM: I don’t know if I said that actually in an interview so I wouldn’t want to be quoted on that again. Yes, I do like playing heavy again. In fact I wanted to do that after Risk was done. I looked at Marty and said to him, ‘Dude we’ve got to stop this, we’ve got to go back to our roots.’ And that’s about when he just quit. The whole reason we went to the extremes that we did was because Marty Friedman wanted us to be us to be a more melodic, alternative band.